Digital marketing can’t really be called digital marketing any longer. For anyone marketing a business, digital is now so core to our work that it’s really just “marketing”. Which means we need to constantly learn new skills because technology doesn’t stand still (as much as we’d sometimes like it to). And along the way, we also need to be reminded of some older skills and activities – things we know but sometimes forget about. One of these is the marketing value of meta descriptions. Meta description is a rather ugly and technical sounding name for “the little bit of copy Google displays when showing a search result for your business”. Which still doesn’t sound that interesting and exciting…until you remember that this little bit of copy can be hugely important on whether people choose to click on your search result, thus visiting your site and spending money with you. Your SEO work often focuses on APPEARING in the search results – your meta descriptions are what help complete that last step of a personal clicking on your search result. Yet all too often, businesses have default meta descriptions appear, or worse still, have messy code or blocked results show up. Which makes people far less likely to click on your business in a search results page. And this is a missed opportunity: a true ‘zero budget marketing’ opportunity as all it takes to improve your opportunity for clicks – and so visitors – is a little bit of time in copywriting. An example of the marketing value of meta descriptions can be seen in the examples below. This is a search on Google for “little black dress”. The first result for The Iconic isn’t too bad, although it’s largely a default meta description. However, the next three – for the-lbd, asos and Hello Molly – are custom written. And they are persuasive and let people know what they’ll find when they click. The final result, for boohoo, is what happens when you let Google grab something random from your site for a meta description. I recently found myself looking at Google webmaster tools (aka Google search console) for a retail site I work with. If you don’t use Google Search Console, you should. It is an awesome (free) tool that shows what search terms customers are finding you through and for those terms, your clicks, impressions, click through rate (CTR) and position you appear in for various search terms. So I was checking the search terms we rank for. It struck me that for some of the terms we were not getting the CTR we should be. That is, we were showing up for the right term, on page one of Google, but not enough people were clicking on us. And this is where meta descriptions and pages titles suddenly become really important. Because almost the only thing that affects what people click on is what shows up for your search result: your page title and meta description. Now, I say ‘almost only’ because other factors do come into play – they suddenly remember they’ve done business with a competitor that appears, or get enticed by a Google advert instead – but meta description and title the only real factor you can actually control. A copywriting test & resubmitting your URL. I focused on the keywords that were getting the most impressions first. So I picked fifteen keywords, put them into Google to see what the search results showed. Then I rewrote these meta descriptions (inside my CMS), keeping the old copy on file and adding the new copy or page title. The final step is re-submitting the page to Google to crawl (which you also do in the search console under the CRAWL site menu and then “fetch as Google”. I found it only took a day or so for Google to recrawl the site and have the new meta descriptions appear. When I say significantly more clicks, some of the CTRs moved up several percentage points, most at least one percentage point. Extrapolate that out to your top 50 search terms and that can mean a whole more clicks – and a lot more potential business. So what sort of thing did I change? Ultimately, I focused on putting more about what the customer would find when they clicked. I conveyed breadth of range. I also added location information, so that people would know that this was an Australian site. I tried to make it more compelling and persuasive and clear. I’ll share one example. The search term was “washi tape” – changing the copy took the CTR from 6.5% to 7.9% – which translates to 91 new prospective customers in a month for this term alone. Notemaker has a wide range of washi tapes, available in different sizes, patterns & colours. Shop online with Australia’s leading stationery store! Australia’s widest range of washi tapes. So many sizes, patterns & colours in popular Japanese washi tape. Hundreds available! Many on sale. Buy online today. So the difference weren’t huge. But it did make a noticeable (positive) difference within a month. A positive test and one that I’ll be continuing to roll out for top keywords. The reason it’s worth treating this like “a test” is not only to track your successes: it’s to find what didn’t work. Two terms did noticeably worse when I changed them, even though I thought the copy was better. So I’ll be changing those back! Gaining real marketing value from meta descriptions isn’t a once off activity. It’s something you’d ideally look at monthly, or every few months, to see where there are gains to be made. It’s something you can do yourself if you don’t have the resources to pay someone too. And it can provide more visitors – and so more potential sales – without a big investment. So what is the marketing value of meta descriptions? It’s a zero budget marketing tool that’s potentially hugely powerful in bringing you prospective customers, yet one all too easy to forget about! Good luck with your own testing! The challenge with most marketing is that you’re dealing with clients or bosses who say to you “I don’t like that” or “That annoys me” when you recommend a tactic. The “pop up box” encouraging sign ups on a website is one of these tactics that can be hard to convince people of. Because they are a bit annoying. They also work. I’ve successfully implemented a pop up box now several times. Each time, it has immediately driven increased list sign up – and increased conversions. Despite sharing these experiences, it can still be hard to convince people. So I was pleased to see this new research report of 400 online retailers that pretty definitively shuts down the argument. According to a recent study by email marketing firm Listrack, pop-ups can help retailers nearly double the rate at which they sign up consumers to receive marketing email. A pop up that includes an incentive, like a percentage off offer, results in an average list increase over a year of a whopping 47.8%! I haven’t ever gotten a 50% bump. But I have achieved a 20-30% bump. It works best when you have an incentive – both in the box and on the thank you page (and ideally the follow up email with the chance to offer something like an upsell). It’s the ideal zero budget marketing tactic – beyond a little bit of form design, you’re spending nothing at all to increase your marketing effectiveness! So if you don’t have a pop up box on your website to capture visitors that don’t buy, you’re wasting an opportunity. That opportunity is building your database so that you have a chance to convert visitors later. A sad fact of eCommerce and other websites is that we only convert a small fraction of visitors to buyers. So why not try and capture information of engaged visitors to try and convince them later. And if you’re left wondering still what a pop up box is…here’s a few examples I’ve come across recently that might help with increasing sign ups to your own website. Good copywriting is hard work – but it’s worth the effort. It’s one of your most critical marketing tools. What do I mean by ‘good’? Words that convey meaning succinctly, persuasively and, in many cases, entertainingly. Words that make your business stand out from the crowd. And it’s not about using big words – often it’s about avoiding them, for maximum clarity. When we’re learning to writing in primary school we’re given sentence examples where we have to replace a ‘plain’ or boring word with a more interesting alternative. But sometimes the plain words still work the best in copywriting. Take the example below – from the homepage of Dropbox.com, a subscription based service that allows you to store your files online and access them from anywhere if you’re online. This the key message on their home page, the main selling message ‘above the fold’. It’s a big risk, in a way, using just two copy lines to try and convince you to invest in what is a simple to use but pretty technically oriented service. Yet it works. It does its job really well. It conveys, in non-technical language, both what the service is, how it works and why you’d want to use it. And it does this job using plain words, like “good” and “stuff”. Based on experience, I suspect it would have taken a long time, and lots of ‘discussion’ with various ‘stakeholders’, to reach agreement on these simple copy lines. Just because they are so simple. I’m glad the writer behind them stuck it out, because these copy lines do their marketing job extremely well. It’s a great reminder to keep working at your copy until it’s a clear and persuasive as this example. There’s a LOT of bad marketing out there – money wasted, missing calls to action, ho-hum offers abound. So when you see good marketing, it’s worth noticing and taking a little inspiration from. Red Balloon have been a “business to watch” for many years. Founder Naomi Simpson is a regular speaker at business events, flying the flag for her business in a one-woman PR campaign! As a successful but purely online business, they’ve honed what works in terms of online promotion – which is why I was interested in this “account credit” promotion I was sent from them. I was recently the recipient of TWO Red Balloon gift vouchers, so created an account and spent the vouchers on a weekend away. A month later, I received this offer: A $15 credit in my account to spend, with 6 weeks available to spend it. This is an immediately enticing offer. Let’s face it: I feel that I have been given FREE MONEY. And I am highly likely to use this “free money”…and likely end up spending a whole lot more with them! They’re on the road to making me a repeat customer, something I hadn’t even really considered before receiving this offer. It’s a clever zero budget marketing tactic that is not used enough in the online sphere. Why is this ‘zero budget’ marketing. There’s no cost to Red Balloon if I don’t use this offer. It’s a zero budget marketing tactic because the business really isn’t spending money unless it’s MAKING money. And if someone spends a “voucher” like this, the spend is usually 5-8 times a voucher’s value. They’re also moving me from a ‘gift recipient’ to a ‘customer’ with this type of offer – rather clever in itself. So if you’re in any sort of retail or B2C marketing, consider how you could use this type of offer in your marketing. It was so refreshing to hear Julia Green speak at a recent City of Stonnington business breakfast. She opened by saying she hadn’t spoken at a public event before about her business journey, and that she planned to be ‘real’ and ‘honest’. 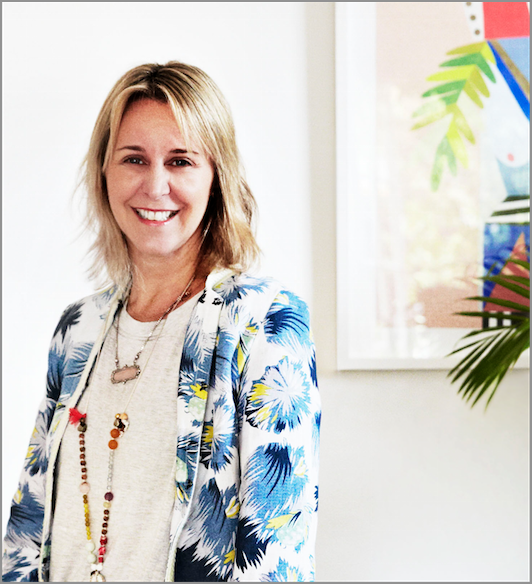 She certainly lived up to this, sharing both the elements of talent, serendipity – but largely hard work and business creativity – that has seen her business (Greenhouse Interiors) become so successful in just five years. I have advised MANY small businesses on their marketing over the years and, honestly, most don’t get this: that being good at what they do isn’t enough. Work will not materialise. You will need to look for it, work for it, pitch for it, sometimes even come up with it yourself. There is almost never a marketing magic wand or marketing silver bullet. Every business must “do” marketing. One anecdote shared by Julia was about watching her favourite show at the time, Offspring, and suddenly thinking she should pitch to STYLE the Offspring house. And include in it one (or more) artworks from one of the 14 artists she also represents. After all, she said, what better way to get huge exposure, on no budget, than by putting a picture above Nina and Patrick’s bed? So she called to pitch it. And it took time. And multipe calls. And multiple contacts. But she made it happen. It’s a marketing – and indeed, a zero budget marketing – lesson we all need to learn (or be reminded of if we’ve forgotten). Work and clients don’t fall from the sky. And business constantly needs to evolve. In a small business, especially in professional services, the best jobs will almost always come through your network, or through you pitching. Even after you’re established and well known. You will still need to always be selling. As long as you believe in what you’re selling, this doesn’t need to be daunting. But if you retain this focus on driving business, it will mean you’re far more likely to be successful than a competitor who’s largely waiting for their phone to ring. Images sourced from Greenhouse Interiors website. I love a good partner promotion. It’s a zero budget marketer’s dream – find someone with a comparable size database and work out a promotion together. 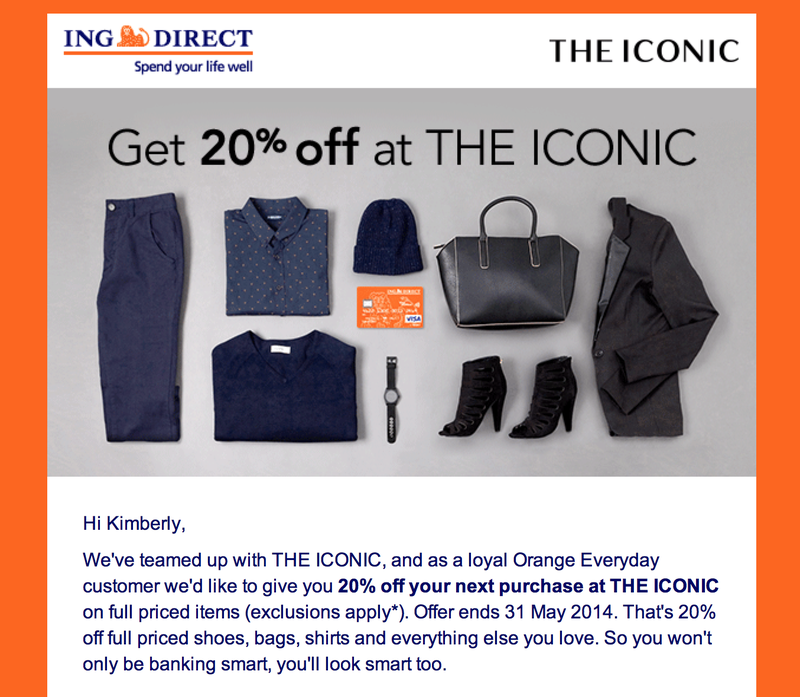 I’ve just received a great offer via my bank (ING Direct) for 20% off at clothing retailer THE ICONIC. It ticks all the boxes – a decent discount, a stylish looking marketing piece, a brand I recognise. I don’t know the details of what these particular partners worked out, but I know I regularly negotiate similar arrangements for clients and NO MONEY changes hands. The extra benefit of these sorts of promotions is that they are always more successful than promotions to rented lists – that is, when you DO spend money. That’s because your promotion has an implicit tick of approval from the organisation sending it, who has a great relationships with it’s own database. So whether you’re a small or large business, someone is talking to the sort of customers you want to access. And someone will want to talk to the sort of customers on your database. So get in touch and work out a partnership promotion today! I’m a direct marketer at heart. It’s how I started my career (so long again it was in mail order shopping, well before the dawn of online shopping!). It’s still what I most trust. I feel safer making an investment (of time or money) where I’m able to say with reasonable confidence “if I spend X, I’ll get Y in return”. It’s the same reason CPC online marketing has become so popular. You get an immediate cost per lead. Now to be a successful direct marketer, you need your own list – preferably an email list, because email is still the killer app. And one of the best (and cheapest) ways to build a list is a competition. I’ve run MANY of these over the years and it constantly surprises me how much information people will share about themselves on the promise of winning something, even something comparatively small. We all love the thought of something for nothing. So if you’re struggling to work out how to build your email list, run a competition. The example I’ve included in today’s post is a perfect zero budget marketing example. 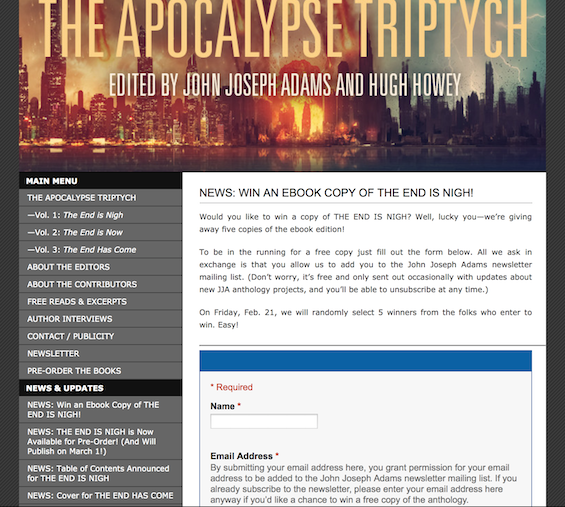 The cost of the promotion is negligible – they’re giving away five copies of an ebook, so at most the ‘value’ is probably $25 – but I guarantee you they’ll get hundreds of entries. And they’ll be valuable entries because the sort of people who want to win a book are obviously ‘readers’ and ‘readers’ are pretty likely to buy books too. The beauty of those people who join your email list is that they become the path to even more people. I’m in the midst of a ‘refer a friend’ promotion with another client, with a total prize pool of only $750 (five spa gift vouchers – both the referrer and the referee go into the draw when the new person joins). The response has been huge – 25% of the new sign ups we’ve had for the offer have come from the refer a friend promotion, despite it being about only 5% of the campaign budget. Building a prospect and customer email list will be THE MOST COST EFFECTIVE form of marketing you’ll ever do. Can you avoid an email unsubscribe? It is such hard work getting someone to subscribe to your email list, but it’s worth it because email is still the killer app of online marketing. To be a good email marketer, you always need to include an opt-out, a chance for people to unsubscribe. But what if you gave someone another option? Perhaps they are annoyed by the volume of your emails (or all their emails, more likely). But if you could offer them the chance to reduce this volume, might they take it? I know recently I did. I’m now living in the land of aggressive and constant marketing (aka the USA) and with a few household purchases have been a little inundated with daily marketing emails. 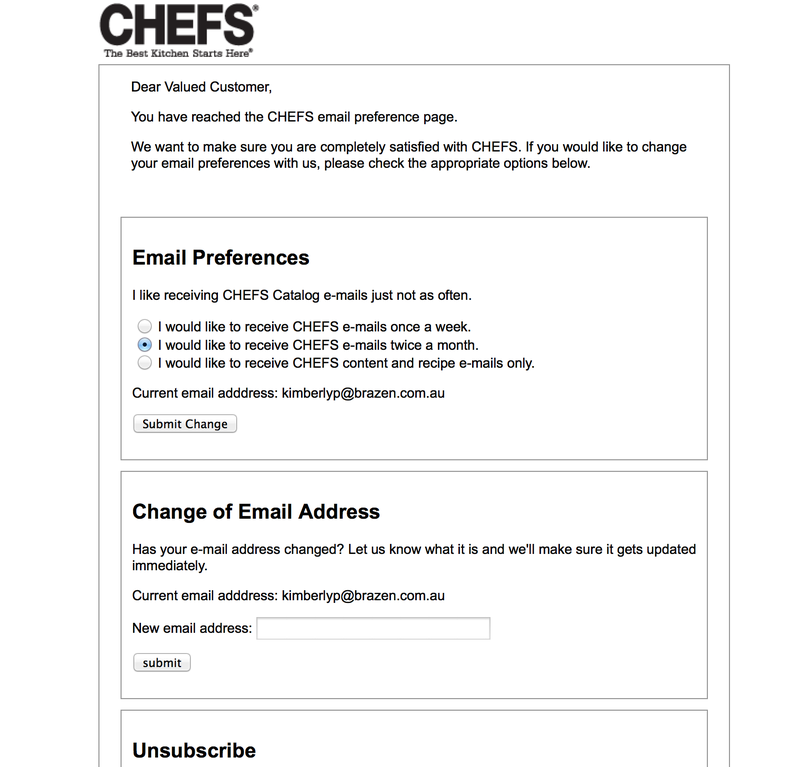 I wanted to unsubscribe to some of them and came across the scenario pictured above with kitchenware retailer Chefs. I could unsubscribe but I could also drop emails to weekly or a couple of times a month. It gave me pause- and I chose twice a month instead of unsubscribing. Like most consumers, I was teased with the fact I might ‘miss out’ if I unsubscribed completely. So clever, because it’s saved them a subscriber – someone who’s purchased from them and really is quite likely to do so again if reminded or appropriately tempted. Why is this zero budget marketing at it’s best? It’s protecting an investment: work already done and money already spent. Could you offer this on your unsubscribe page? Or if you don’t have that level of customisation, perhaps on your unsubscribe page you can give people the option to engage with you on social media by liking your page or following you on Twitter. These can be less ‘intrusive’ and if someone wanted to hear from you once, maybe they still do, just a little less often. Here’s to holding on to those subscribers in some way, shape or form! Why is the up-sell and ideal ‘zero budget marketing’ technique? It’s additional ‘sales’ with no real additional effort! 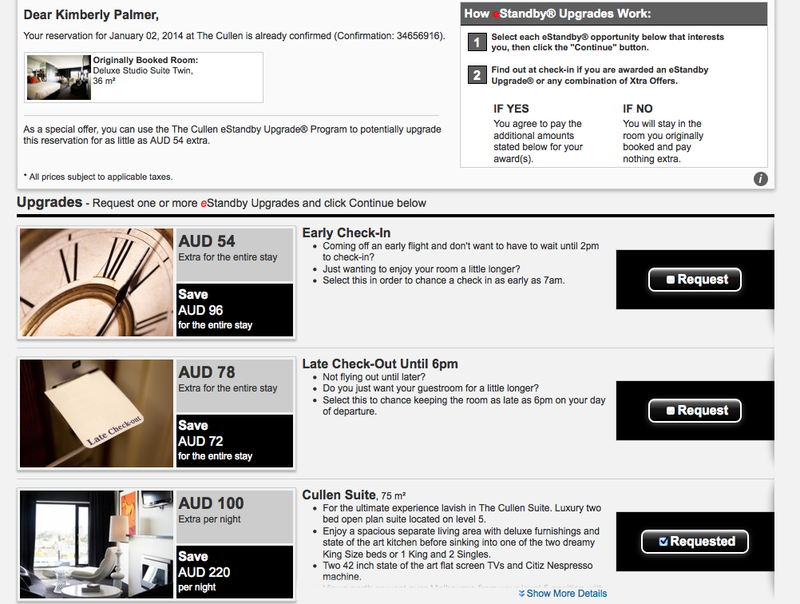 I was reminded of the power of the upsell recently when I booked a hotel room at The Cullen in Melbourne. After completing my booking, I was offered a selection of potential paid upgrades. And I opted for the Cullen Suite ‘potential’ upgrade. Now what’s funny is that I’d know about the suite but had decided I should probably just go with the cheaper room. Yet when it was then offered it after I’d already committed to booking with the hotel, I wavered and committed to the upgrade. And thus if the suite is available when I arrive, the hotel makes another $200 off me. And all it took was some clever thinking on their part. I doubt I’m the only easily swayed consumer out there. In fact, I know I’m not. It’s the same reason it’s easier to convert a subscriber to a buyer at the time they sign up. We make decisions all the time, but they’re rarely set in stone. As consumers, we’re open to persuasion, especially when we think they’re something in it for us: a better deal, a better offer. So where could you incorporate a ‘good value’ upsell in your sales process? Whatever you do, keep the originals! There’s a situation that has come up over and over in dealing with businesses who sponsor events I’m involved with or that I want to feature in blogs or newsletters. It has happened so often it’s prompted this post. I urge you to take heed, particularly if you’re starting out in business. When you get a logo designed, a product or professional head shot taken, or even a brochure designed – get the original files and file them somewhere safe and easy to access! It will save you a lot of money, and stress, down the line. Many people still don’t know the difference between a ‘high res’ (high resolution) and a ‘low res’ (low resolution) file. I’ll ask for high res and someone will send me a 50 kb jpeg. You always need to have the largest files possible. Why? If you provide a low resolution file, it can’t be used for all applications – that is, it can’t be used in print and can’t be made larger in any way, or it will distort. You can’t make a photo or image file larger without degrading it’s quality. Image files usually end in extensions like. .jpg or .png. As a rough guide, a high resolution file is usually quite large – over 1 MG – and if it’s a logo, it will ideally end with a .eps (Adobe Photoshop) or .ai (Adobe Illustrator). So make sure you don’t just file away small versions of images or logos – get the largest ones possibly upfront and file them somewhere handy. Otherwise you may find yourself having to get logos recreated or images re-shot, which costs you money! Designers and agencies prefer not to give you “working files” – but I’d encourage you to negotiate upfront to get these, even if you have to pay a little more. There are some valid reasons for why they don’t want to give you working files – not wanting you to ‘ruin’ their work by tinkering, to have it go to another agency to change and that they want you to come back to them for future work and edits. However, for many smaller businesses, you simply don’t change artwork very often. And relationships with designers can be transient – who you use one year is often different the following year, perhaps because someone was doing you a favour, or you have a disagreement, or because they’re no longer in business. If you don’t have the original files, and you want to make changes and don’t have the original files, a new designer will need to start from scratch. And this costs you more money.